Fact: Did you know that much of the salmon sold as Wild Salmon has never seen the outside of a pond. Buy Alaskan Wild Salmon from a source you can trust. Potatoes, Sausage, Corn, and Shrimp boiled in a single pot. A simple way to feed a large crowd. Perfect for Beach Parties. If you prefer you can also bake the tuna casserole in the oven. 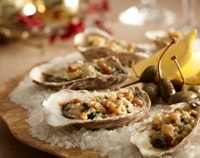 Garlic Linguini with Oysters Recipe. Citrus Wahoo Recipe from the beautiful Beqa Resort in Fiji. Recipe provided by Head Chef, Laniana Lewaka. 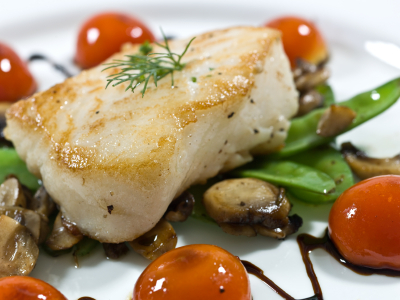 Quick and Easy Mahi-Mahi Recipe. You can grill, bake or broil. Wonderful Maple Bourbon Marinated Salmon recipe. Easy stove top or electric skillet meal. Love the capers and feta cheese. Very easy Oyster Stew. Can be made in under 30 minutes. Salmon Recipe. Pan Seared Salmon with Orange Vinegrette Dressing. P	asta and artichokes in a creamy lobster sauce. Tilapia cooked with a honey, rasberry sauce. Fitness gurus and dietitians love salmon because it is low in fat and calories. I love to cook salmon for another reason, it's easy! Easy to make Tuna Casserole recipe. My kids love this casserole. 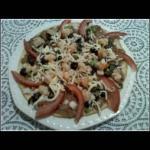 Yummy shrimp tostadas with veggies, re fried beans and fried flour tortillas! Tender scallops nestled in a sauce of sweet and tart pomegranate juice, floral rosemary, and golden brown, wonderfully nutty almonds. 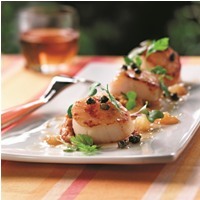 Serve the scallops and sauce with rice or couscous on the side and don’t miss a drop of the delectable glaze! 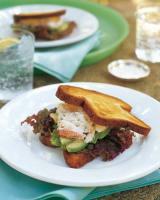 The Shrimp Council and "Bob & Joe's Smart Seafood Guide, A Practical Look at Seafood." Shrimp Tortilla Canapés Recipe was provided by Port Royal Seafood. Where you can get the best tasting shrimp in the world! Not only do you get the good Omega 3 fatty acids from the Salmon but you get the calcium benefit from the cheese.